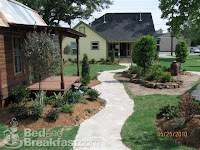 Deep in Pasadena, Texas (a community just southeast of Houston) there’s a rustic oasis called the Silver Sycamore. 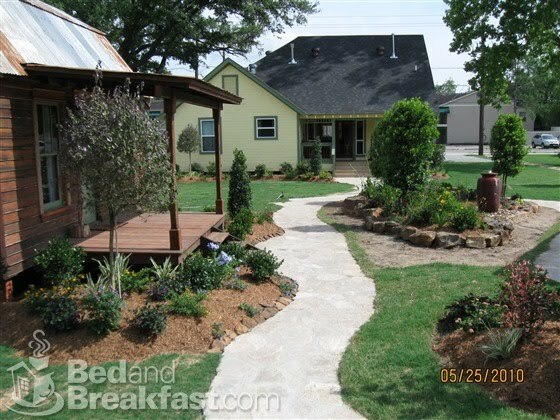 Trundling down Pine Ave., a two-lane blacktop leading away from the bustle of Beltway 8, one comes unexpectedly upon this campus of quaint cottages nestled in lush landscaping. 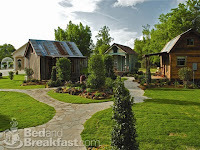 The compound includes a tea room, a garden with a picturesque gazebo, and an elegant reception hall. It now extends across the street to a shop, spa, and bridal accommodations. Since my publicist, Miranda Spigener, is the daughter of the Silver Sycamore’s owner, I scored an invite to an open house this Sunday. The event introduced the gift shop, four tiny rooms packed with all sorts of imaginative goodies: cold-insulated dip servers, teas, dip mixes of every description, cookies, cup & saucer sets, unique kicked-up condiments, local honey, and more gadgets, collectibles and gizmos than I can remember. I came away with a large, colorful pumpkin cookie and a pound of pecan flavored coffee beans. Tantalized all the way home by the aroma, I couldn’t wait to brew it. It was so good. It was so smo-o-o-oth. It is SO the reason I’m wide awake at 3:26 AM writing this. But I learned even more from the chatter in the checkout line. 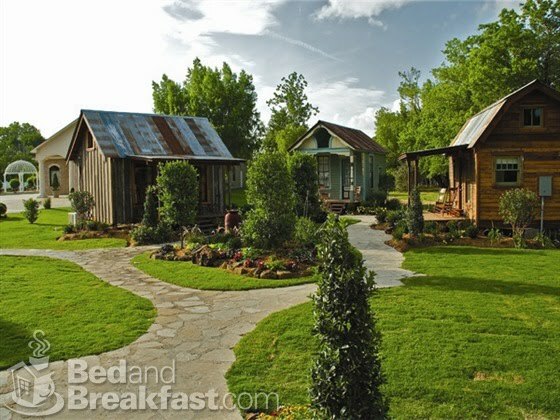 It seems one of the cottages is a place where a bride can sleep, then prepare the next day in the well-mirrored parlor. At the proper time, a horse and carriage arrives to deliver her in style to the site of the ceremony: either the lacy gazebo or the reception hall. The Silver Sycamore is the inspiration of Jackie Spigener. This winsome, wispy blonde who looks younger than my daughter is the driving force behind this project. She and her husband, both with backgrounds in construction, have been bringing the dream to life a piece at a time. Fi rst the gourmet Tea Room, then the B&B, then the bungalows – all either existing historic buildings or retro-built using materials recovered from 19th century homes. There’s so much more than I can feasibly present in a blog. Please visit their website: http://www.silversycamore.com/ore.com/ and their Facebook page: http://www.facebook.com/silversycamore for the rest of the story. Better yet, go! That was a lyric from a mini opera on Mister Roger’s Neighborhood, and in this case it’s poignantly true. I hadn’t given any thought at all to a cover for my sci-fi The Hundredth Spring. First things first, after all. I haven’t even found a publisher for it yet. 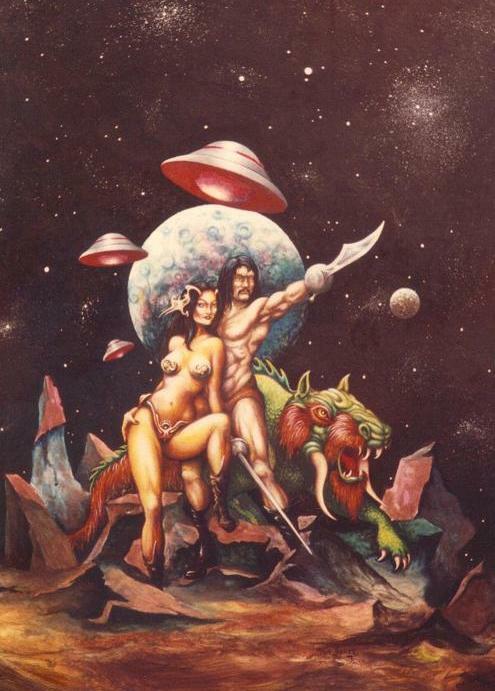 Then out of the blue my editor, Mary Sell, sends me these incredible pieces of art that immediately fired my imagination. She wrote: Stan and I have a friend in Kentland who's an artist. His forte is sci-fi action figures. He's about 55 and disabled. He’s lived with his parents since the onset of the illness in his late teens. "Back in the 1990s his dad took him to New York to the comic book publishers and book publishers with a portfolio of his art, but they got nowhere and it was very dish eartening for him. Tom also does pencil and pen and ink drawings. "Last fall his father died, and his mother's in a nursing home. Tom is able to live on his own. I believe he would love to do a painting of one of the scenes from the Ammanon series. I've attached samples of some of his work. Well, the Ammanon books already have an established theme so I, of course, thought immediately of The Hundredth Spring. Obviously that would be the better application of his talents. Personally, I think his work is too emotional and expressive for comics. The pleasing pla y of shapes and colors, the imaginative way he leads the eye though the scene – the man’s an illustrator, not a cartoonist! I sent descriptive passages from Spring and background notes to be passed on to Tom. Whatever his disability, there’s no doubt he’s capable of creating exactly what I want. In fact, I can’t imagine anyone doing better. So I’m calling dibs, folks! Remember my friend Glenis Thomas? I blogged about her blueberry cookbook about a month ago. She lives in Wellington, NZ. I emailed her when I learned about the 7.2 quake on the news. She replied that she’d slept through the whole thing! Wellington, you see, is on North Island. The epicenter was near Christchurch, which is on South Island. However, she’s since been sending me links to the local media and sharing eyewitness accounts that you’ll never catch on international news. It seems that New Zealand sits above an ongoing collision between the Pacific and Australian tectonic plates. 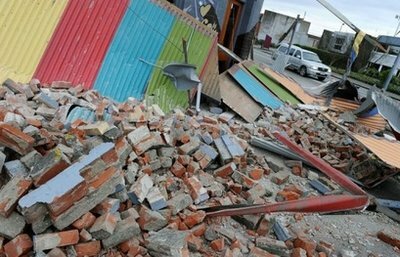 The country records more than 14,000 earthquakes a year, but only about 150 are felt by reside nts. Fewer than 10 a year do any damage. Now Canterbury University geology professor Mark Quigley (OMG. Quigley Down Under?) 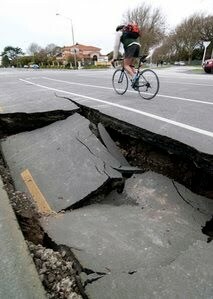 says it looks like a new fault line has been ripped in the Earth’s surface. “We saw two houses that were completely snapped in half," he said. 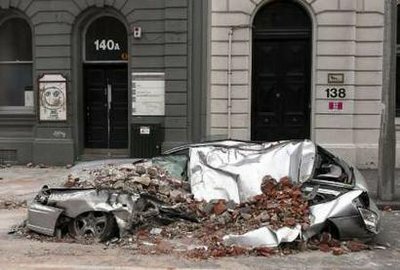 As you can see, the greatest damage and debris is fallen bricks. Glenis tells me almost everything there is brick. Yet only two serious injuries were reported as chimneys and walls of older buildings were reduced to rubble. 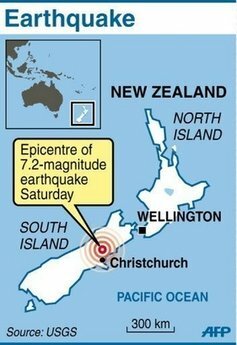 Prime Minister John Key said it was a miracle no one was killed. "If this had happened five hours earlier or five hours later (when many more people were in the city), there would have been absolute carnage in terms of human life," he told TV One News Sunday. A 15-year-old boy was asleep on the 2nd floor, his bed against the outside wall. When the quake woke him, he rolled over just as the outside wall of his bedroom ripped away. He fell to the ground as the interior wall collapsed onto his bed, escaping with only scratches and bruises! The house, a lovely country home, was completely destroyed. 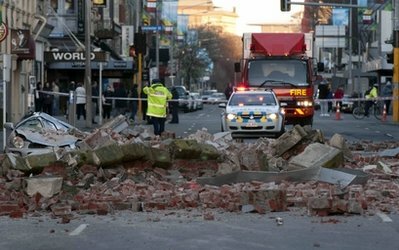 A young woman awoke when her friend, screaming at her to get up, pulled her out of bed just as the outside brick wall collapsed onto the bed. She said she felt the brush of a falling brick go passed her head. Glenis says the street in a new suburb must be right on the fault line. All the upscale homes there have been moved and twisted from their foundations. They are uninhabitable as are hundreds of others. Wow, Glenis! I think I’ll stick to hurricanes!